By tradition, the biggest mansion on the south side of Riften is always called Mistveil Manor. 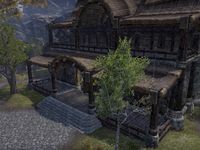 Since the death of old Thane Snelgar, the current Mistveil Estate has come available, including its impressive stone mansion with attached stable. Old Mistveil Manor is a large player house in the eastern Rift. Though Old Mistveil Manor includes a yard and barn, the house itself is almost identical to Grymharth's Woe save for the inclusion of a full upstairs balcony and a small entrance foyer below the balcony.